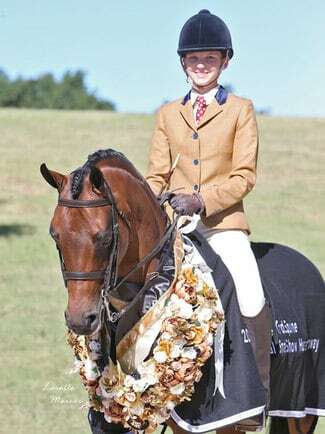 Brianna Duncan-Coward had her dreams come true at the 2015 Show Horse Grand Nationals when she and Corndale Kiss and Tell (Baci) took out the title of Grand National Small Show Hunter Galloway. Brianna’s mother Susan has been feeding all their show horses the VF Natural Diet for several years to make sure they are at their optimal health so can perform at their best, both mentally and physically. Other strategies which they feel have helped their horses do well in the show ring is to work with instructors whose training methods they believe in, and to ensure the horses always have access to paddocks during the day, to keep them happy and relaxed. Brianna explains “I am always working on different exercises/movements to train them in and lots of stretches to keep them supple and I really enjoy the training aspect of my riding and teaching them new movements. It really keeps their minds working and their ridden work interesting for them. One of my priorities when training my horses is for them to have a beautiful soft mouth,” Brianna points out. Baci was purchased from Melissa Karutz in SA and the Duncans became part owners of him in late 2010 when he was still in his newcomer year and took full ownership of him after Grand Nationals in 2011. Over the years Brianna and Baci have had a different array of instructors including Mel Karutz, Les Friend and Margot Haynes, and since September last year Chris Lawrie has been travelling to teach a group locally, so Brianna has been having regular lessons with Baci and her hack Richie. They have been working on Baci’s lateral movements, flying changes and even started to teach him piaffe. The Duncans have owned Baci for over 4 years. Susan says he is the most strong minded intelligent horse she has owned, he is a real character. He just loves being a show horse and all the attention that comes with it both in and out the ring. He learns everything easily and loves training but equally happy to go for a trail ride or a gallop along the beach. He has won numerous HOTY titles in SA in his hunter classes and Brianna’s rider classes competing at Grand Nationals and EA Nationals on numerous occasions. He has always got Top Ten in his Hunter & Childs classes at Grand Nationals and in 2013 we were awarded Runner Up Childs Show Hunter Galloway. Since recovering from his illness and returning to the show ring in 2015 Baci has come back winning Champion Small SH Galloway and Champion Childs SH Galloway at the 2015 HIA-SA Australia Day GN Qualifying Show. Then Champion Small SH Galloway at the 2015 SHC-SA Rising Star Show. Then a few weeks later at the 2015 SHC Grand National Championships Brianna was elated to win the title of Grand National Small Show Hunter Galloway with him. Baci then went on a couple of classes later to take young Georgia Davey to win Grand National Rider 12 and under 15 years.